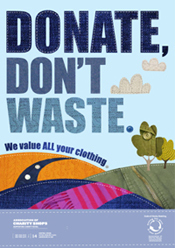 DONATE, DON ‘ ‘T WASTE … is a powerful campaign by Association of Charity shops. The main aim of the campaign is to urge people to donate their unwanted clothes by decreasing the amount of landfill dumping, thereby encouraging green living.This is a very thoughtful campaign which can persuade people to think before trashing their unwanted yet useful clothes which may not be worn from years. If each UK household donated one extra black bin bag of clothing, we could save 25 million bags from landfill and raise over £740 million for charity. Clothes which cannot be sold in-store can be sold to textile merchants to raise money for good causes. (Contents from http://www.charityshops.org.uk/donate.html). Even though the exact cause of the incident is still unclear, there is a suspicion that, build up of pressure in the ultra deepwater has caused the explosion.BP is trying to tackle the problem in number of ways. It has showered the sea with 76,000 tons of dispersant to break up the oil, boats are being used to skim the thick oil suspends.As a safety measure, Bp has set up barriers stretching several miles along the coastal shore. Under the surface, six robots are still trying to close the valve that was meant to prevent explosions. http://www.telegraph.co.uk/finance/newsbysector/energy/oilandgas/7677217/Gulf-of-Mexico-oil-spill-a-QandA.html. More effective steps should be taken to stop the oil spill as its hampering the lives of aquatic and bird population, causing trouble to local fisherman and agriculture and most importantly its disturbing mother nature.